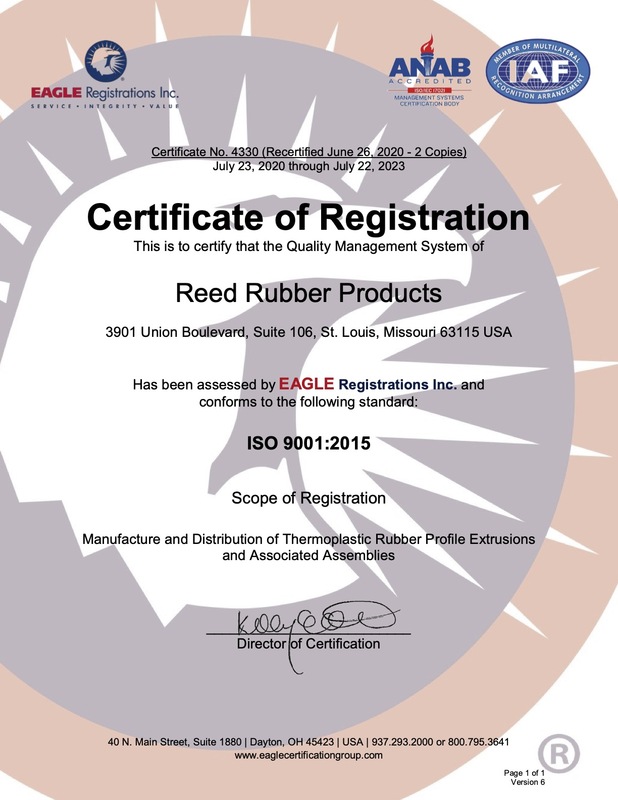 Reed Rubber Products is one of the country's leading manufacturers of precision thermoplastic rubber extrusions and fabricated parts for the construction, automotive, HVAC and OEM markets. With thirty years of experience, you can be sure to get the best technical advice, the highest quality, and lowest overall cost. We maintain a full complement of downstream equipment for cutting to length, in-line printing, hole punching, thermo bending, splicing, and so on. Our ISO 9001:2015 quality program is supported by widespread use of SPC techniques and in-line measurements. When it comes to sealing air or water, TPV (thermoplastic vulcanizate) is vastly superior to PVC. It outperforms PVC through a broad range of temperatures, and does not degrade over time the way PVC does. It will even outperform many EPDM and neoprene blends, yet has the design flexibility of plastics.